These double decker hammocks are perfect for nosey rats, who can snuggle in them, or lounge on top of them! Each hammock is made of two hammock layers, and are suspended using metal eyelets. Both hammock tiers are made of a layer of faux fur and a layer of fleece. 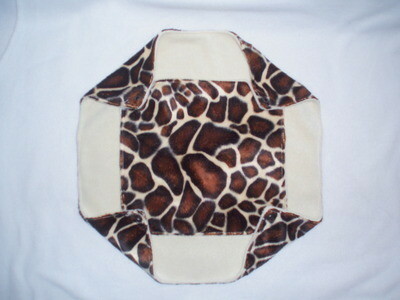 Both tiers are made of a single layer of cream fleece, and a single layer of giraffe faux fur. Each of our double decker hammocks has a lower tier measuring approximately 14" square, and an upper tier measuring 9" square, suitable for rats, suger gliders, and hamsters.